Kathryn says: Okay, so I had a lot of fun with the title on this one. Shake up your diet with this tasty, tangy drink. My tangerines were about to enter the danger zone of over-ripeness, so I peeled them up and froze them. One morning, I took a handful of segments out of the freezer and threw them in our awesome blender. 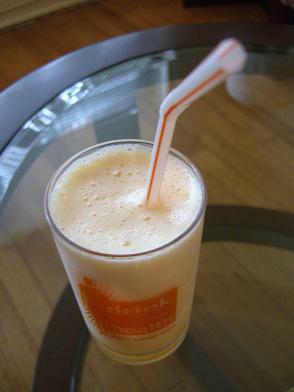 I added Dole’s Orange Pineapple Banana juice and a splash of Lactaid fat-free milk and blended away! It made for a particularly frothy, creamy breakfast treat. And hey, it’s healthy too! Jamie says: I was on a mission to find the perfect dessert recipe for my party. I searched through my cookbook with recipes I have collected over the years, and it came to me- brownies with Andes Chocolate Mints in them! 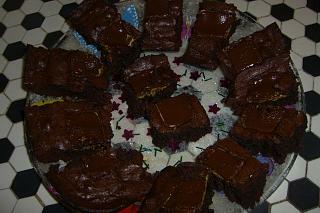 I’ve been craving mint chocolate all week, and brownies are a good party food. So, I found a brownie recipe I had saved from the newspaper (New Classic Brownies), modified it, and added Andes Chocolate Mint Brownies . Preheat oven to 400 degrees Farenheit. Spray a 9 x 13″ pan with PAM cooking spray. Melt 1 cup of Smart Balance Omega Buttery Spread with 8 oz unsweetened chocolate in a big bowl in the microwave, stirring frequently. Stir in 2 1/2 cups sugar, 2 tsp vanilla extract, 1/2 tsp salt. Stir in 4 eggs one at a time. Stir in 1 cup all-purpose flour. Add Andes Chocolate Mints on top. I used 16 Andes Chocolate Mints (Creme de Menthe) (4 by 4). Bake for about 32 minutes. Makes about 32 brownies. Enjoy! Kathryn said they were the best brownies she’s had in her entire life. A lot of people at the party said they really enjoyed them, too! Nutrition note: Enjoy in moderation. Each brownie contains about 170 calories. 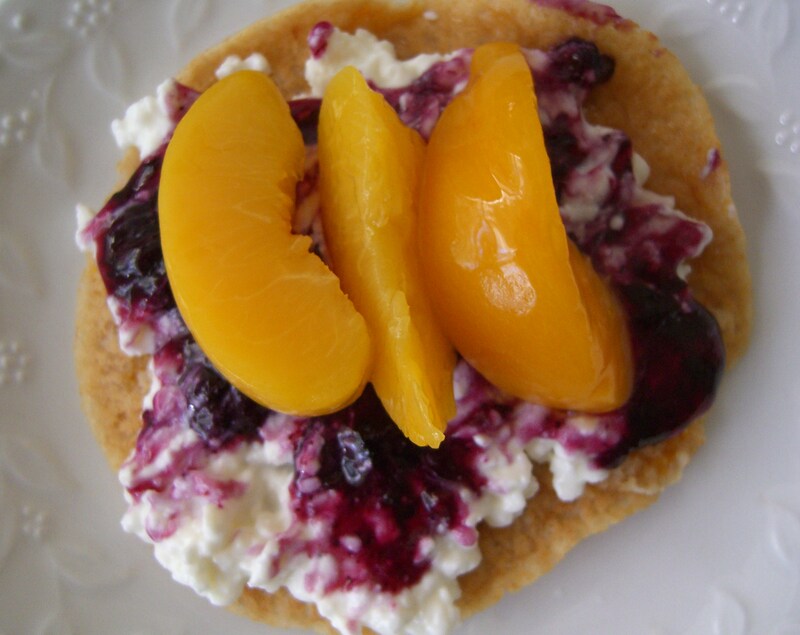 Kathryn says: Play up your pancakes by topping them with cottage cheese and fruit. I used Kodiak Cakes wholegrain pancake mix. I topped my pancake with Breakstone’s Cottage Doubles’ with blueberry topping and Publix canned yellow cling peaches in pear juice. I microwaved the entire thing for about 45 seconds for a warm treat. It was bursting with sweet flavor and way more filling than maple syrup! Jamie says: I’ve found a new favorite snack- or is it a dessert? I can’t decide. 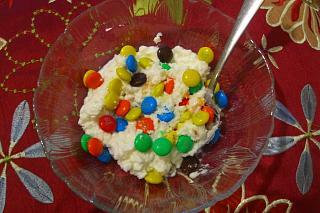 It’s cottage cheese with m&m’s. Part of me wants to put it in the snack category because cottage cheese is a healthy food. Cottage cheese has vitamin D and calcium, fiber, and protein. But, chocolate is dessert to me. I’ve decided I am going to think of it as a healthy dessert. Regardless of its category, my recipe is so simple and so amazing. It only has two ingredients! One 4 oz container of Breakstone’s LiveActive 2% Milkfat Lowfat Cottage Cheese with Dark Chocolate m&m’s. (Hint: don’t mix the m&m’s too much or they lose their color). It is fabulous! I love the sweet and salty combo. Nutrition note: If adding some m&m’s gets you to eat a milk group food, I belive it’s worth the tradeoff of adding a sweet treat, because calcium is very important for bone health. Kathryn says: For a tasty mediterranean-style salad dressing, mix ricotta cheese, red wine vinegar, olive oil and dried spices (oregano, basil, rosemary, thyme) and pour over greens. I used spinach, tomatoes, carrots and cucumbers for my salad. 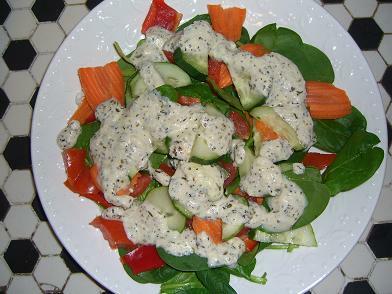 My friend and I agreed that it was quite tasty – a flavorful, thick, but not-too-rich dressing. Jamie says: I’ve been on an iced tea kick lately. Iced tea is a nice substitute for water. I made a couple of batches of this refreshing drink in my neat little Crate and Barrel pitcher that I got for Christmas. Drinking green tea has some health benefits, too. In my Nutrition and Immunity class, we’ve been learning about how green tea positively affects the immune system. 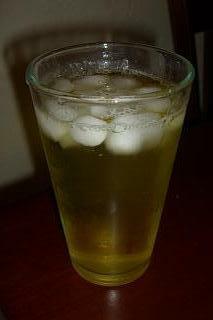 To make green tea iced tea, add 2-3 tea bags of Lipton Decaf Green Tea to hot water. Stir in 2-4 packets of Truvia. Pour over lots of ice. Enjoy or refrigerate for later. It’s quite refreshing. Nutrition note: Truvia is a natural sweetener made from the leaves of the stevia plant. Truvia is a sugar substitute that has 0 calories. Jamie says: I usually enjoy a big bowl of cereal with sliced fruit and lots of milk for breakfast- but not today. 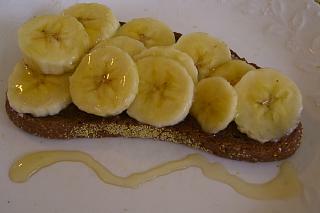 I toasted 2 big slices of Publix pumpernickel bread, slathered it with Smart Balance Omega Buttery Spread, topped it with sliced bananas, and generously drizzled Publix Pure Clover Honey on top. I poured myself a glass of Publix skim milk and sat down with K at the table. The tasty toast was crunchy, creamy, sweet, and slightly salty- the perfect combo. Breakfast was so good, I might have the same thing again tomorrow. Nutrition note: Bananas are a good source of potassium, vitamin C, and fiber- all for only 110 calories (for a medium banana).